In lustrous black nylon and lace, this is one of those wonderful slips that feel like heaven to touch. What you can’t see well in this photo, is that the bodice and hemline ruffle are in tiny accordion pleats. The original label was removed, which I’m always sorry to see, but for a seventy-year-old she’s in marvelous shape. I have reinforced some places in the stitching that had become weak and re-set one of the straps. That’s all. I suspect that the “brown” lace was originally black and that it’s fabric has faded with age. I kind of like it this way, but may also dye it back to the original – easy to do with most slips because nylon stands up well to hot water. I love it that we can now wear wonderful lingerie as dresses in the summer, for evening or as sleepwear. It’s also perfect under midi-length dresses from the late ’30’s to the early ’50’s, of course, (and 1980’s – wait till tomorrow).. . . . . . . . . . . . . . . . . . . . . . . . . . .
Fun and interesting mid-century and antique table and bed linens often show up during my investigations. The prints are humorous, colorful and pretty. Modern copycats can’t come close! If there is handwork like embroidery or lace, it’s beautiful. I collect them, too. The mending and stain removal that is sometimes required is no big deal and anything with too much damage can be made into pillow covers and cloth napkins. I love using these things at home in my kitchen and bedroom, but there’s more . . . . . . . . . . .
Big pieces of fabric are also wonderful made into clothing and accessories. Trim can sometimes be added to other garments or a big piece of crocheted or tatted lace makes a beautiful dress or blouse. Can’t you just imagine this cloth made into a summer dress, skirt or blouse, maybe with a matching handbag? Can’t wait to use this cute tablecloth! 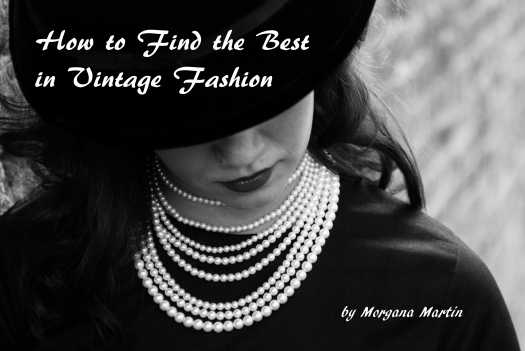 Potential vintage fashion treasures abound everywhere! Use your imagination and you never know what you may uncover . . . . . . . . . . . . . . . . . . . . . . . . . . . . . . . . . . . Interesting! I’ve come up, in the past 3 or 4 years, with three dresses in this basic style – crossover bodice, wasp waist, poufy sleeves and shoulder augmentation – all in formal styles. The first find was true 1940’s, the second was ’40’s to early ’50’s and this last is 1980’s doing the Forties thing. This frock’s styling is a real dog’s breakfast. It gives a nod to the bubble skirts of the Eighties in spite of the mid-calf length and in a ’50’s-style bright pastel – which to me is kind of an awkward trendy marketing ploy that fails in the final analysis. No matter. It’s fun to see what happened with the same style over the years and this one will go to the university theater due to some un-fixable damage. It’s a hoot to explore the back alleys of fashion history . . . . . . . . . . . . . . . . . . . . . . . . . . . . . . I still come across true vintage handkerchiefs once in a while and always collect them. This one is not fine linen or even high quality cotton and started it’s life as a commercially-made piece that probably had no decoration excepting the machine-done edging, BUT the delicate applique needlework down in the left-lower corner is the real story. Some woman who couldn’t afford more expensive linens made a dainty item with her own hands. It is almost unbelievable with the tiny, tiny stitches and the steps taken to prepare the pieces that were sewn on to make the flower. Girls used to be taught this kind of hand work in almost every home before WWII time, and many still afterwards. If not lace-making, tatting or applique’ by the late mid-century, girls at least learned some embroidery, crochet or knitting. My own grandmothers still knew how to do it. Even though paper tissues are more convenient now, a fabric handkerchief is very elegant and just the thing when attending a wedding or other private affair. The decoration on most of them is gorgeous, whether hand-done or by machine. Even the printed patterns are lovely or at least colorful and amusing. If you’re into home sewing, I’ve seen these hankies pieced together and turned into pretty pillow tops, table linens and even blouses, skirts or dresses. So, another little story unfolds for me to share with you. . . . . . . . . . . . . . . . . . . . . . . . . . . . .
there’s a cellophane collar prop still in place, a paper tag hanging from a button, a paper square in the pocket that was placed there by the final inspector, and an inventory stamp near the hem. An interesting thing about the fabric (besides being Sanforized) is that the weave gives it stretch, without any of our modern spandex. An extra tag sewn at the neck advertises this. The sleeves will be too long for me so, of course, I’ll end up selling it but the best thing is the way that the story still unfolds. From what I can resource so far, this may have been a British brand. A find like this is always worth picking up just for the fun!